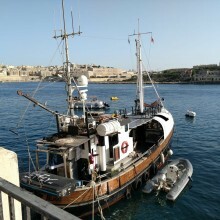 We are a small husband & wife family-run B&B Boat, Charter Yacht & Water Sports Business in Malta (Europe) looking for the help of a skilled General Purpose Deckhand with boat & yacht maintenance experience or willingness and enthusiasm to learn on the job. Duties involve preparing breakfast for the guests (when any onboard), be available for check in / check out, basic boat & cabin cleaning and help maintaining, promoting and running all aspects of our B&B Boat, a 37' Charter Yacht and a number of watersports equipment; JetPack, Jetovator, Jetskis, self drive boats etc. Position is of a permanent 'liveaboard' nature, travel time away from boat will be allowed for in the slow winter months (with advance pre-agreement). Position includes free 'liveaboard' lodging, shared traveling and victualing expenses, Euro 500 allowance p/m + 5% commission on B&B, charter yacht & water sports bookings reserved during owner sponsored promotions & 10% on all other bookings you find yourself on your free time. Candidates with experience in the hospitality, boating or yachting business + wood, steel, fiberglass boat maintenance and car, boat, yacht, tender driving experience will be given preference. A good understanding of spoken and written English is a must. Salary €500 allowance, FREE lodging, Shared Expenses + 5-10% commission! !